It was an honour to receive the award and we would like to thank all of our clients who have written testimonials over the years, and continue to spread the good word about our work. Stone carver and letter cutter Fergus Wessel speaks about his passion for fine lettering in stone. 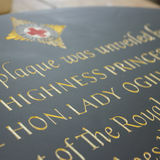 An introduction to his work including finely hand carved gravestones, headstones, opening plaques, commemorative plaques and heraldry. 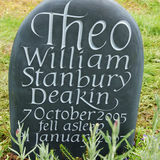 Fergus runs Stoneletters, a creative letter carving studio in Oxfordshire, with clients all over the UK including St Paul's Cathedral. Based in Oxfordshire, just over an hour from London, our memorials, gravestones and plaques can be found all over the country. 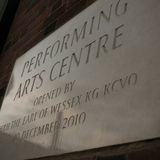 Established by Fergus Wessel over 15 years ago, clients include The Royal Albert Hall, Oxford University and Alan Titchmarsh. Stoneletters in May 2015 completed a large headstone for Guy & Lettie Benson in Stanway Churchyard, with Cumberland slate inset into Cotswold (Guiting) Stone, beautiful lettering and a carved scallop. The work was very well done. 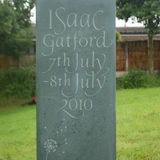 Following the sudden passing of my beautiful husband, the time came to select a headstone to represent his life. My two young children and I visited all the local memorial makers and felt dissatisfied with the lack of uniqueness and choice; the same brochures of the same stones in each one we visited. I wanted something special and unique, something that would be beautiful in years to come and that the children could be involved in the process. We wanted the memorial to be uplifting tribute rather than a thing of sadness and sorrow, despite our obvious feelings of grief. When I found Fergus and Hannah’s website and spoke to Fergus on the phone, I instantly felt reassured and knew then that I had made the right choice. We discussed drawings and ideas and he invited us to visit the workshop. It was obvious to see that each stone was special to Fergus too, a labour of love for the husband/dad we love so much. The headstone itself, now respectfully and reverently installed, is totally beautiful and exactly what I had pictured. I know that it will help my children to see just how special and unique their daddy was and, due to their involvement in the process, that they made something beautiful for him. Fergus helped me to reflect on the choice of the words at one point, which he did in a kind and gentle way, but as a result, the words we have chosen now, are perfect and will stand the test of time as an uplifting tribute to my husband’s much loved, yet too short, life. I am so very grateful that I found Hannah and Fergus and I encourage others to seek their help, if you are in a similar position and have lost a loved one. Anyone can buy a headstone but these stones are made with love for the ones we love. 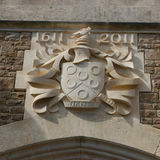 Stoneletters is a creative stone carving studio run by Fergus Wessel. 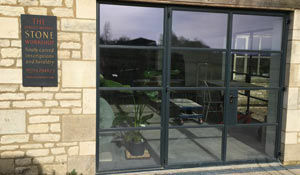 Established over ten years ago, we have clients all over the UK. We specialise in fine, hand carved memorials, opening plaques and architectural lettering which range in price from £3500 - £10000 +VAT. We recently won the Good Funeral Guide Award for the Best Maker of Hand Carved Memorials in an indigenous material.